The Lord speaks to us in ways we often miss. He has many ways of speaking, including through the Bible, prayer, circumstances, spiritual gifts, common sense wisdom, conviction, His character, His peace, natural things, and even in times of silence. Discover how God’s voice becomes familiar to you as you develop a loving relationship with Him. 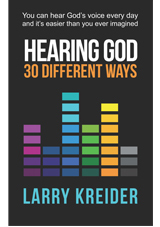 Take the next 30 days, reading a chapter each day, to explore 30 of the many ways God speaks. Expect to be surprised! Read through it with your small group or congregation! Each chapter has discussion questions. Audio book and Teaching Outlines available! I know of no other book that zeros in on so many specific ways that God speaks. Joel Comiskey, Ph.D., author, California.